Leading Manufacturer of auto billet loader from Pune. We are offering Auto Billet Loader to our clients. In forging industries, generally, billets are cut by sawing or shearing. The speed of billets cutting differs from the speed of forging. Also, industry needs to isolate cutting, so that common cutting facility can be used for various forging lines. The common practice is to collect cut billets in bins, and use them whenever required. Normally the billets are manually fed into the IBH. It requires one dedicated unskilled labor per line for continuous feeding of billets. Also, a separate arrangement needs to be done to provide sufficient quality of billets to this person. Loading point is approximately 2mtrs above the ground. Our Auto Billet loader lifts billet from the hopper on the ground floor and feeds to induction heater in pre-decided orientation. Material feeding to IBH is consistent. Extra-man power required in conventional feeding method is eliminated. Hassel free loading of billets into IBH is possible. Billet cutting machine can be integrated with auto billet loader so that intermediate operation of bin shifting is eliminated. Very less operating cost. Only electrical, no hydraulics, no pneumatic. The vertical conveyor will not start unless billets get cleared off the through beam sensor thus saving power. The payback period of this equipment is less. 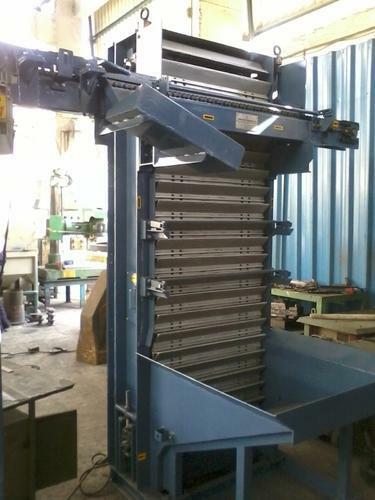 Auto billet loader can be used on 1000, 1600 & 2500 Ton press line. Considering its application, the design of billet loader is heavy & rugged. It is provided with the very high level of safety for human and for the system. VFD is provided for vertical conveyor thus speed of vertical conveyor can be varied. Precise electrical & electronics control with the latest technology is incorporated into the system. Suitable for the large size range of round billets (RCS shaped billets not used). Looking for “Auto Billet Loader”?